Going to the ballpark, visiting friends and playing bingo are simple diversions for many of us. 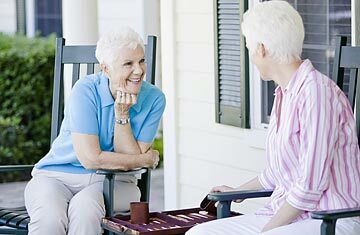 But for the elderly, these social pastimes may play a critical role in preserving their physical and mental health. In fact, a new study suggests that the less time older people spend engaged in social activity, the faster their motor function tends to decline. "Everybody in their 60s, 70s and 80s is walking more slowly than they did when they were 25," says Dr. Aron Buchman, a neurologist at the Rush University Medical Center in Chicago and lead author of the study, which was published in the June 22 issue of the Archives of Internal Medicine. "Our study shows the connection between social activity and motor function  and opens up a whole new universe of how we might intervene." An increasing body of evidence has suggested that participating in mentally stimulating activity, socializing frequently and exercising may help protect against age-related decline  at least cognitive decline. As early as 1995, neuroscientist Carl Cotman, who studies aging and dementia at the University of California at Irvine, published a paper in Nature showing that physical exercise produces a protein that helps keep neurons from dying and spurs the formation of new neural connections in the brain. More recently, Cotman demonstrated in studies of elderly dogs and mice that enriching their social environment is associated with improvement in brain function. Researchers are also finding that social activity may be linked to the same protective effect in people. A recent study of 2,500 adults ages 70 to 79, published in the journal Neurology, found that those who were able to stay mentally sharp were also those who exercised once a week or more, had at least a ninth-grade literacy level and were socially active. But what has social activity got to do with motor skills? In Buchman's study, which looked at 906 seniors, average age 80, in northeastern Illinois over a five-year period, increased social activity was associated with adeptness in a range of physical tasks, including walking in a straight line, standing one-legged and on tiptoes, turning full circle without falling and placing pegs on a board. On a social-activity scale of 1 to 5  with 1 indicating participation in various social activities once a year, and 5 showing activity every day or nearly every day  a one-point difference in social activity corresponded to a five-year difference in motor function. With each one-point drop on the social-activity scale, study participants' rate of physical decline increased 33%. In participants whose score fell one point over the course of a single year, that translated to a 40% increased risk of death and a 65% higher risk of a disability. "The idea that cognitive and physical function are connected is something that has just come out in the last few years. It is one of the new horizons in health care and prevention," says neurologist and aging expert Dr. Joe Verghese of the Albert Einstein College of Medicine in New York City, who published an article in the New England Journal of Medicine in 2002 showing that changes in walking patterns could be an early sign of dementia. While further research needs to be done to establish the exact impact of social activity and exercise on specific age-related declines  it's likely that a reduction in social activity may simply be a symptom of physical decline, since people may naturally withdraw from social engagement as they lose motor skills  most researchers would agree that it is not unreasonable to encourage seniors to get out there more. Only 10% of people over 65 get the recommended amount of exercise (at least 2.5 to 5 hours a week), and given that seniors already tend to be more socially isolated than younger adults, it's difficult to motivate them to become more active. "If you are alone, you are less likely to follow recommendations," notes Verghese. It might help, though, if you visit with Grandma more often and let her know that a regular pastime may just help her stay fitter and sharper longer. See pictures of CNN host Larry King.